What Causes Hot Flushes In Menopause? One of the most common and troublesome symptoms of menopause is hot flushes but what causes hot flushes and what can you do to minimise the effects of this annoying issue? The drop in oestrogen is a significant catalyst, however it is not the only cause, as symptomatic and asymptomatic women have both been found to have similar levels of circulating oestrogen, indicating other factors at play. The frequency and severity of hot flushes can range from occasional (eg. a few mild flushes per week) to severely disabling – occurring sometimes hourly, with sufferers feeling completely overcome with heat and unable to continue their normal activities for the duration of the flush. Physiologically, the hot flush is a heat loss mechanism – whereby short-term initiation of vasodilation in the blood vessels near the skin increases the exposure of the blood to the surface of the body, allowing heat to escape and lowering core temperature. Initiation of this response occurs when the hypothalamic thermostat registers that core temperature has exceeded the normal range. 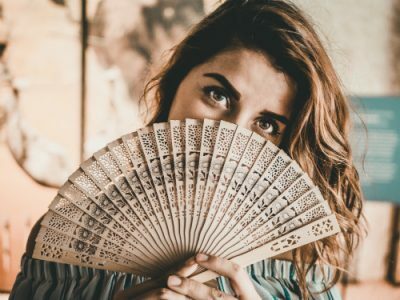 However, this does not mean that symptomatic menopausal women have more severe core temperature elevations – instead, these women exhibit a narrowing of the thermoneutral zone, meaning the thermostat is much more sensitive to essentially normal fluctuations in core body temperature. Low GABA, low serotonin, high noradrenaline and low oestrogen all contribute to the narrowed thermoneutral zone. Along with the contribution of low DHEA (a hormone produced by the adrenal glands), the role of altered neurotransmitters (GABA, Serotonin) provides a physiological explanation for the common clinical observation that women who suffer or have suffered from severe or long-term stress undergo a significantly more troubling menopause. Hot flushes, therefore, may be used a clinical indicator of a patient not just requiring oestrogen support, but one also needing stress and adrenal support. When trying to ascertain what causes hot flushes in individual patients, we always consider stress and adrenal function when we see patients presenting to our clinics with menopausal symptoms. Do you or someone you know suffer from hot flushes, sweats, low libido, depression or any of the other common menopausal symptoms? For hormone-related conditions, conventional medicine offers few solutions: synthetic hormones and antidepressants are the most commonly used strategies, neither of which address the underlying drivers, and can be associated with risks of their own. The science of intracrinology provides us with an alternative therapeutic strategy. The body still uses oestrogen post-menopause – however it uses it sparingly, converting it as needed in the relevant tissues from circulating precursor hormones such as DHEA. It seems that those women with sufficient circulating DHEA avoid many of the symptoms of menopause becoming clinically significant. Book an appointment to see one of our practitioners who will thoroughly investigate your adrenal function (including DHEA levels), as well as all the other factors that may be contributing to your menopausal symptoms. We will then address these underlying drivers to help you transition though peri- and menopause gracefully!